Right now is a good time to give us feedback on your training needs for this fall. We’re always offering inhouse trainings, we we bring up your team to higher levels of SIP, Kamailio or Asterisk understanding – maybe while working on an architeceture for an improved or new plattform. In addition, we’re offering trainings together with partners like TeleSpeak in the UK, Elastix Mexico, Avanzada 7 in Spain, Gonicus in Germany, Connection Telecom in South Africa and Redfone in Miami, USA. 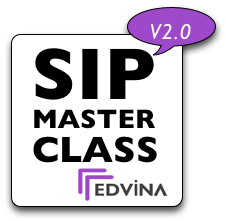 The main classes are the Edvina SIP Masterclass and the SIP Update Class that both covers Kamailio and the SIP protocol. For inhouse trainings we have a lot of Asterisk training material – both for admins and 3rd party developers. Many in-house trainings are covering the SIP protocol or related areas of TCP/IP – like security with TLS/PKI solutions, directory services and much more. The Avanzada 7/Edvina SIP Masterclass in Malaga, Spain in July 2013 is soon fully booked – we have a few seats left for late bookers. There will be two short trainings in Mexico City in October – something you can combine with a visit to Elastixworld 2013! We’re also pondering classes in the USA and Sweden. What would fit you best? Give us feedback on e-mail – info (at) edvina.net!